Tennis, like most sports, is largely a matter of scoring more points than your opponent. But the game-set-match scoring system used in tennis differentiates it from other contests. In basketball, scoring more points than your opponent defines victory. In tennis, scoring more points tends to lead to victory, but it's not a guarantee. It also matters when you score your points, and whether those points help you win sets. In a recent post for FiveThirtyEight, Carl Bialik covered this topic, referring to matches in which a player wins, despite winning fewer points, as a "lottery match". Using data from Tennis Abstract, he found that 7.5 percent of mens' matches ended in this way. For this post, I will take a closer look at these lottery matches and use it to define a "luck" measure for tennis, which will be added to my tennis win probability graphs. Using data from Matchstat (ATP matches from 2008-2013), I looked at how often a player wins a match as a function of the percentage of points that were won. The table below summarizes the results, split by whether the match was a best of 3 or best of 5 format. As you can see, the chances of winning the match accelerates rapidly as a function of points won, where winning at least 53% of points will virtually guarantee a match victory. MOV stands for "margin of victory", and it is the percentage of points won, minus 0.5. 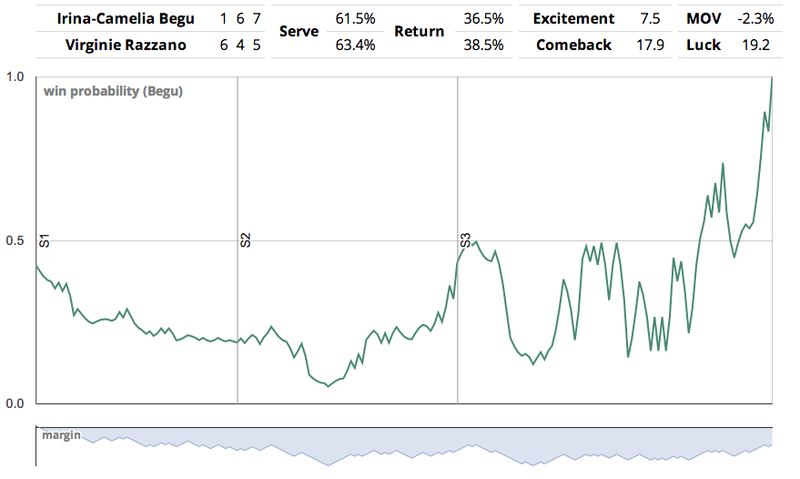 For my tennis win probability graphs, I convert the probability into odds and call this "luck". So, the higher the "luck" factor, the more unlikely the result of the match. The luck factor is now a sortable option for my Top Match Finder. For example, here is the luckiest match of the Wimbledon Womens Singles: Irena-Camelia Begu's three set victory over Virginie Razzano. Begu won the match despite having won just 47.7% of the points (a net point differential of -9). Using data from Matchstat, the luckiest match in ATP play from 2008-2013 was Juan-Martin Aranguren's 6-3, 0-6, 6-4 victory over Carlos Berlocq in 2010 at Orbetello, in which Aranguren won just 44.4% of points in the match. The odds of winning a best of 3 match with only 44.4% of the points is 1300 to 1 (or a probability of 0.08%).